The International Centre for Integrated Mountain Development (ICIMOD), together with the Institute for Advanced Sustainability Studies (IASS) in Potsdam, Germany, organized a tutorial workshop on the Weather Research and Forecast with Chemistry (WRF-Chem) atmospheric modelling system from 1-5 June 2014 at the ICIMOD headquarters. 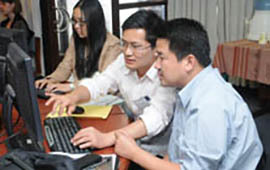 Weather Research and Forecasting (WRF) is the latest generation open-source meteorological model. It was developed collaboratively by several agencies in the United States, including National Oceanic Atmospheric Administration (NOAA)/NCEP, NOAA/ESRL, and the National Center for Atmospheric Research (NCAR). It is a tool used by over 20,000 users in 130 countries for both atmospheric research and operational weather forecasting. WRF-Chem adds in gas-phase and aerosol chemistry, allowing simulation of interactions between air pollution and meteorology, such as the impacts of air pollutants on clouds and precipitation. The aim of the tutorial was to enhance the capacity of atmospheric scientists in the Hindu Kush Himalayan region to use the WRF-Chem model, and to encourage them to build collaborations across borders. It was attended by 20 participants from six regional member countries, selected on the basis of their professional experience and computing skills. 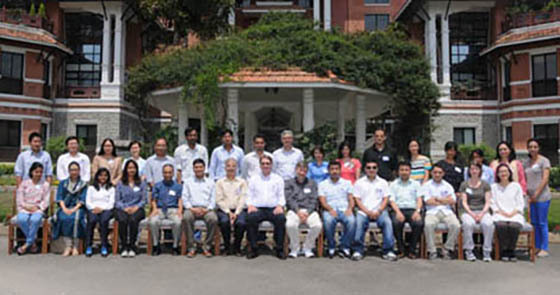 They received training on setting up and running the WRF and the WRF-Chem model over the South Asian – Himalayan domain, taught by four scientists from the United States who are among the original developers of WRF and WRF-Chem.